I studied Modern & Medieval Languages and Linguistics at the University of Cambridge, taking my Ph.D. in 1972. Having taught previously at the University of Cambridge and the University of Southern California and served as Director of the Department of Linguistics at the Max Planck Institute for Evolutionary Anthropology, Leipzig, I am currently Distinguished Professor of Linguistics at the University of California, Santa Barbara. I am a member of the Academia Europaea, a corresponding fellow of the British Academy of Sciences, a corresponding member of the Saxon Academy of Sciences, and a foreign member of the Netherlands Academy of Arts and Sciences. My main interests are language universals and typology, historical linguistics, linguistic fieldwork, and languages of the Caucasus. In my work on typology, I have undertaken the cross-linguistic examination of tense-aspect systems, causative constructions, relative clauses, nominalizations, reference-tracking devices, ditransitive constructions, valency classes, and numeral systems. A special interest is the use of evidence from different disciplines, in particular linguistics, genetics, and archeology, in order to solve problems relating to prehistoric human migrations and contact. I joined the LSA in 1969. I was living in England at the time, and I recall that back then joining was more difficult than one might have expected. I sent an airmail letter asking to join, and after several weeks received a reply by sea-mail asking me to fill out the attached form – only there was no attached form. But I persevered, wrote back, got the form, sent it back with a US dollar check obtained from my bank, and have been a member ever since. Nowadays all you have to do is go to the LSA website and type in your credit card details. No excuse for not joining! My course will be an introduction to linguistic typology, i.e. the systematic study of cross-linguistic differences (which of course also means that one must bear in mind cross-linguistic similarities). In addition to covering basic theoretical and methodological prerequisites (such as the construction of representative samples), I will be looking at a number of phenomena as illustrative examples of cross-linguistic variation, ranging from old favorites like word order to more recent interests such as reference tracking, and including relative clauses and various other empirical domains. 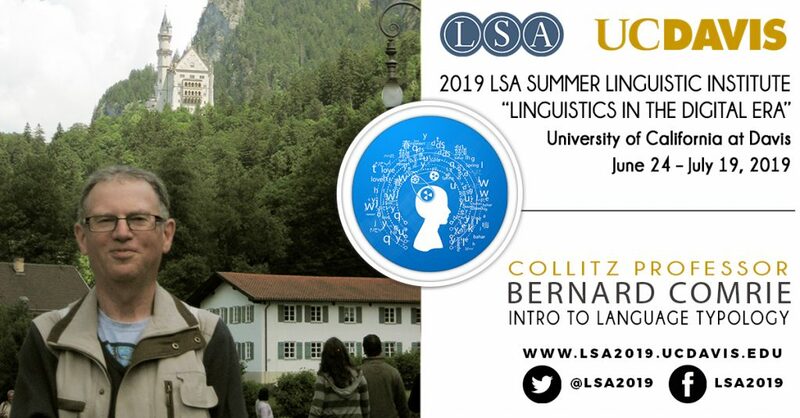 Although the course duration is only four weeks (with eight 90-minute sessions), I hope to give students the opportunity of hands-on experience with either a cross-linguistic project or a project investigating a language of interest from a typological perspective. My current research involves an interplay between writing up grammars of languages I have worked on (as collaborative efforts with other scholars) and investigating theoretical issues that arise from that work (or elsewhere). I am working on grammars of two languages of the Caucasus, Tsez and Bezhta, and of the Haruai language of Papua New Guinea. In addition, I have recently embarked on a project examining the surviving materials on the extinct traditional Great Andamanese languages (of the Andaman Islands in the Gulf of Bengal), with the aim of writing up grammatical analyses and dictionaries. Among theoretical topics that have gained my attention recently are: (i) Generalized Noun-Modifying Clause Constructions (GNMCCs), whereby the same construction is used not only to translate English relative clauses but also English examples of the type “a cake where you don’t get fat”; (ii) Verb Root Ellipsis (VRE), a phenomenon whereby, contrary to predictions of morphological plausibility, a language allows omission of the verb root while retaining its affixes (and which I first noticed in Great Andamanese languages); (iii) and Possessor Camouflage, whereby an intermediate possessor like “Kim’s” in the possessor chain “Kim’s uncle’s house” receives a different morphosyntactic treatment from the ultimate possessor “Kim’s” – this has been noted in the treatment of some individual languages, but the materials have not hitherto been brought together as a unified phenomenon of cross-linguistic interest. I love traveling, and of course being a linguist is a great excuse to travel: Whenever they ask you why you’re there, it’s because of the interesting local language. OK, it doesn’t work in Antarctica, and I’ve never been there. But I have been to every other continent, not to mention many islands. I also love music, mainly classical, but also some folk/”world” music. But strictly as a consumer, not a performer. As a child I was given a violin; although playing it was fun, that is definitely not where my talents lie. Davis is my kind of linguistics department. It covers a wide range of the field of linguistics, from grammar to applied linguistics, from instrumental phonetics to psycho- and neurolinguistics – my apologies for not listing all the riches! – in a collaborative environment. I am familiar with some of the faculty’s work (the extreme case: John Hawkins and I were students together in Cambridge, England and colleagues for two decades at USC! ), and I look forward to getting to know the work of the department’s newest faculty acquisitions. I hope that the summer of 2019 will lead to longer-lasting scientific cooperation. Although I have lived in California since 1978, I am almost completely unfamiliar with the Davis area, and the Central Valley more generally. I gather that the summer is the best time to see it at its most extreme. I have two specific pieces of advice that may seem strange given my own background. For the record, the English school system I came through required an early decision on whether one was going to pursue Arts (i.e. Humanities) or (Natural) Sciences, and I opted for the former – which meant, for instance, that I took my last Math class at age 15. Once I discovered (also at around age 15) that there was a subject called Linguistics, I knew that that was what I wanted to do, and I have been fortunate in being able to realize that ambition. Today’s graduate student in linguistics should take advantage of the possibilities of extending their range of skills, in particular to include quantitative skills. I have the excuse that I’m too old to learn statistics – you don’t! You should always keep in the mind the possibility that you may end up, perhaps willingly, outside the field of academic linguistics in a job that will nonetheless make use of your linguistics skills, whether teaching English abroad or working in natural language processing. Always keep abreast of developments in other relevant professions! So don’t just be a clone of me. A world full of clones of me would be a very boring place; after all, it was precisely diversity (of languages) that got me into this field. And although I am generally of a peaceable disposition, if I had a clone, we’d fight.